“a great little machine to start with and if you have the '96 and the 2010 you can do any and all procedures. Very smooth running and a minimum of chatter. Great to add to your tool kit. I would also recommend the hand tool with the great velvet needles." The new 2010 machine is the sister to the KP 96. There are 2 additional parts to this machine but it uses all of the KP components including the needles, tip & sleeves . So this backup machine is really for all of you that want to use the slope needles. It's design is better for the slants. We have the 5 slants and 3 slants with tips. It is available as a kit for $125 which includes slope needles and the new precision tips. 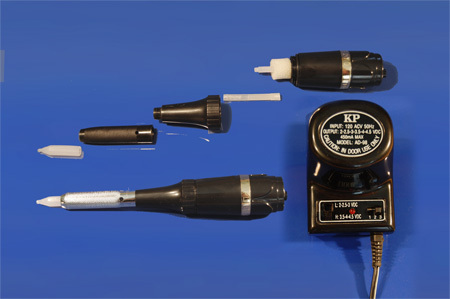 The KP 2010 uses the same needles as the KP 96! Joyce Says...For lips, brows & eyes. These are new wonderful needles. Puts in Max color fast! Joyce Says...for lips, brows & eyes. Do a full lip fast with these. Puts in lots of color!